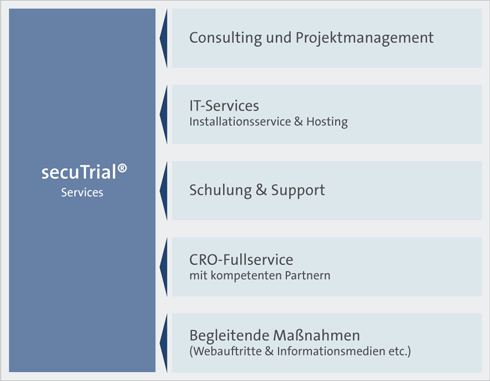 Comprehensive services for successful projects. With over ten years of experience in the conceptual design, implementation and management of medical studies, we are familiar with all industry-specific aspects and solutions in practice. Our experience ranges from national and international study projects involving university institutions, CROs and pharmaceutical companies through to patient registries and competence networks in public research. As customer satisfaction is of paramount importance to us, we work closely together with our customers and adopt a cooperative approach during all phases of a project. A dedicated project manager will serve as your main point of contact at our company and will supervise the professional implementation of your project, ensuring that everything is conducted transparently and on schedule. From the initial planning stage of your project through to its conceptual design, roll out and conclusion, your assigned project manager is always fully informed about the current project status, the latest decisions, agreements and schedule. You can also address any questions, suggestions or criticisms you may have to your project manager. Our flexible consulting and service portfolio offers you a complete service package as well as the option to individually combine modules as required.